When you place an order for this product, our system will generate a Gift Certificate email with a custom Gift Certificate code for $20 to use at TruTechTools. In addition to the New Order email you will also receive a Gift Certificate email with the details about how to redeem the Gift Certificate. If you wish, you can send the Gift Certificate email directly to someone by filling in the recipient email address above. Or sent it to yourself and forward the Gift Certificate email to the person who will be redeeming the certificate. Simply enter the Gift Certificate code in the "Apply Coupon" box in the Shopping Cart. This will display the Gift Certificate amount and the balance due with the order. Physical Gift Certificates are available upon request. Give us 1 week after purchase to create the Gift Certificate and mail it . 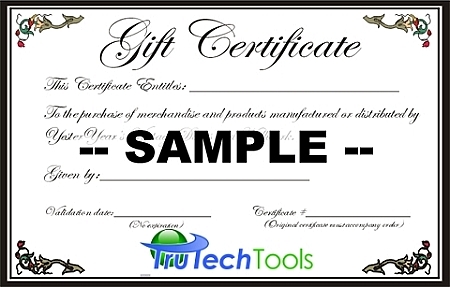 Please email billy@trutechtools or call us at 1-888-224-3437 option 1 to arrange the physical gift certificate.